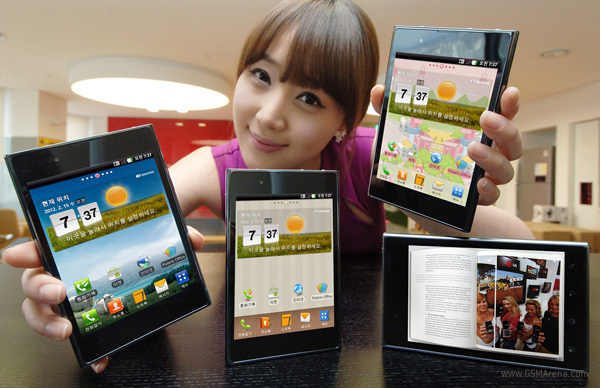 LG has officially announced the Optimus Vu in Korea. The Optimus Vu is a 5″ touchscreen smartphone with a 4:3 aspect display ratio. LG have been known to show off their devices before MWC by posting sneak peeks, teasers or even announcing certain devices as in the case of Optimus Vu. It’s main rival is the Samsung Galaxy Note. The Optimus Vu however is much wider than the Galaxy Note. The Vu is 8.5mm thick and 90.4mm wide while the Note is 9.7mm thick and 83mm wide. We would expect the Optimus Vu to be much harder to handle considering the fact that it is much wider than even the Galaxy Note. Even the smaller thickness would not help much with such a wide phone. The phone will be available for purchase in Korea starting sometime in March. The pricing has not yet been disclosed.